On Tuesday, October 17, the WPSN-C co-hosted an Evening with Parliamentarians with Senator Marilou McPhedran on the East Block of Parliament Hill. Our event was co-sponsored by Members of Parliament Hélène Laverdière, Elizabeth May, Anita Vandenbeld and Parliamentary Secretary Karen McCrimmon, as well as by Senators Mobina Jaffer and Grant Mitchell. The objectives of this event were straightforward: bring together Parliamentarians (and their staff) with Canada’s civil society leaders and experts on the Women, Peace and Security (WPS) agenda to learn about, discuss, and identify areas of interest and concern regarding WPS and Canada’s actions and priorities to date. We held the event “world café style” for the diverse network of the WPSN-C to highlight key issues from their perspectives. We curated four tables that guests could visit in fifteen-minute intervals that featured individual and organizational experts from across the network. These included an Introduction to WPS table, a table on Gender Perspectives in Peacekeeping, a table on Conflict-Related Sexual Violence and the Role of Women’s Rights Organizations, and a table on the Role of Women’s Rights Organizations in Building Peace. 1 – Most of our guests were brand-new to the topic of Women, Peace and Security. Being at the “WPS 101” table, this became a clear trend. Mayssam and I made a point of asking our guests what they knew about the WPS agenda so that we could establish a baseline for our fifteen minutes with them. Most told us that they had very little knowledge about it, but knew they wanted to learn more. I had one individual, a parliamentary assistant, ask me about how he could learn more about WPS agenda as something he could bring to his boss. He explained that he already has a passion for the environment and combatting climate change, and believed the WPS agenda was another worthy cause to learn more about. 2 – Most of our guests asked the important questions about gender equality, women’s rights, and the role of Canada’s National Action Plan (NAP) on WPS. We found that our guests wanted to dive right into the major issues surrounding the WPS agenda and Canada’s unique role in it. We focused a great deal of our “WPS 101” time on addressing the United Nations suite of Security Council Resolutions on WPS, and what Canada’s obligation was to it. We discussed Canada’s first NAP and how it had expired at the end of March 2016, and that we were waiting on the next iteration following many meetings and consultations with Global Affairs Canada. Finally, we stressed that what we wanted to see from Canada’s next NAP was a comprehensive, whole-of-government toolkit to help the various (and vastly different) government departments implement the tenets of the WPS agenda easily, efficiently, and effectively. 3 – All of our guests were passionate about women’s empowerment in peace processes. 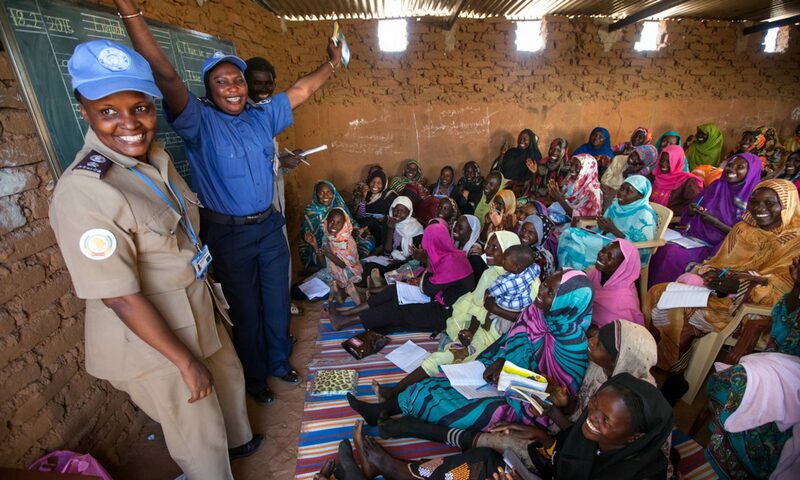 There was universal agreement around the table at each fifteen-minute session that women’s voices needed to be amplified in peace building, peacekeeping, and conflict prevention. Our guests wanted to know how Canada’s NAP and the WPS agenda could ensure women’s empowerment in peace and security. We stressed that Canada’s NAP needs to show government departments the way forward in not only understanding the importance of women’s empowerment and gender equality, but also providing concrete tools for departmental cultural transformation in support of gender equality, keeping the WPS agenda top-of-mind, and making sure that issues of gender equality didn’t disappear following monitoring and evaluation processes. 4 – There is significant political focus on the WPS agenda. 5 – More and more Canadians are learning that they are feminists – and this is awesome! this is the only way we will be able to create a document that can work as a tool to implement the WPS agenda in the most effective way possible. To be a feminist means to see the world for its inequality, for its imbalance of power, and for its inability to uplift its most vulnerable voices. Canada’s next NAP on WPS must enable this point of view, so that it can be used to produce equality, balance power, and amplify voices that have been quelled for so long. Sarah Tuckey is a PhD Candidate in Public Administration at the University of Ottawa, and a member of the WPSN-C. Her research engages in critical feminist analysis of Canada’s foreign policy, and she is currently writing her dissertation on Canada’s whole-of-government approach in Kandahar, Afghanistan. In her spare time, she works as a consultant and volunteer with the WPSN-C, lending her expertise to analysis of issues of feminist foreign policy and the WPS agenda in Canada.